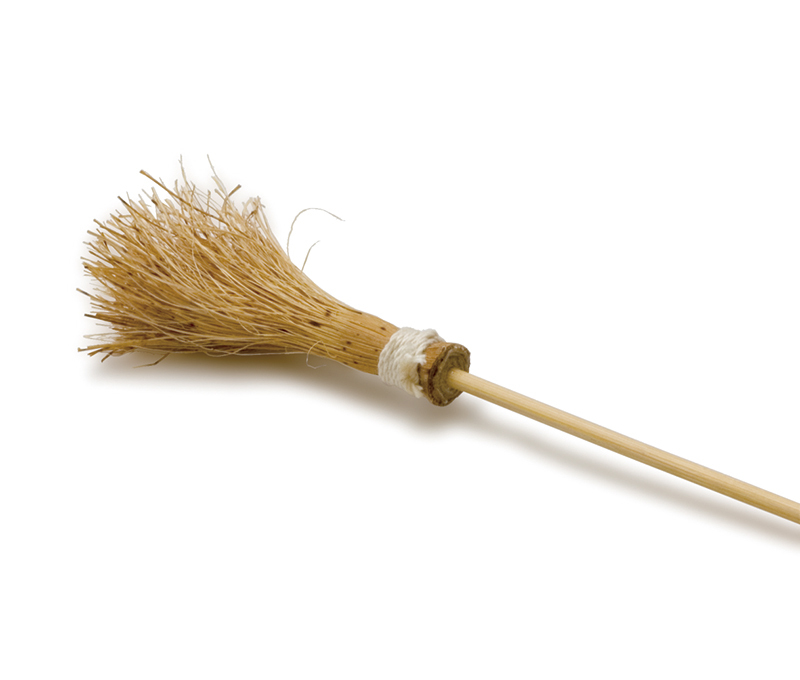 The hakobi, made from finely split bamboo skin that is gathered on a stick like a broom, is used in water-color woodcut printing applications to dissolve paint and transfer the dissolved paint to the woodblock. In use since the days of ukiyoe, printmakers would make their own hakobi by themselves. The hakobi is also referred to as a tokibō. 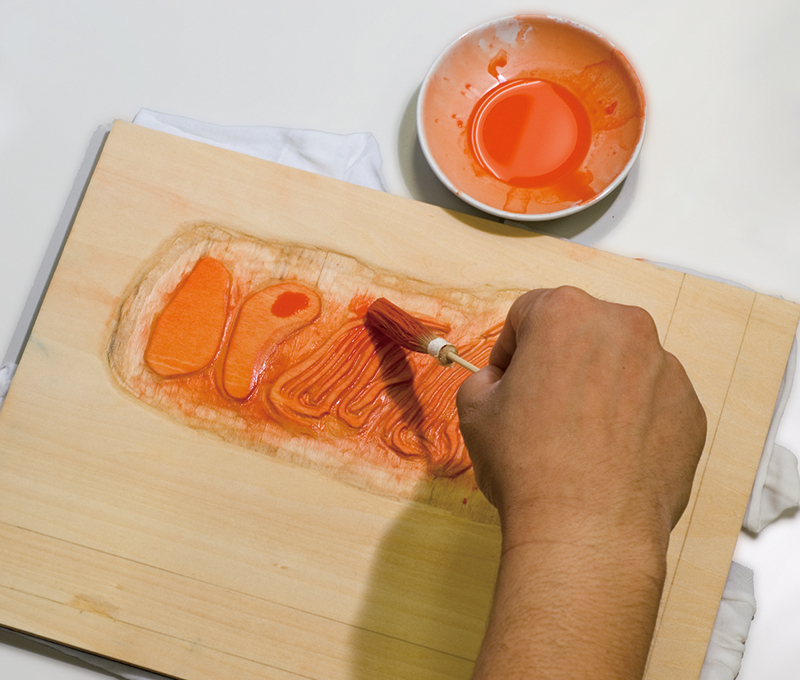 When using a hakobi, the artist gathers paint on the split bamboo skin portion of the hakobi and transfers the paint to the block. 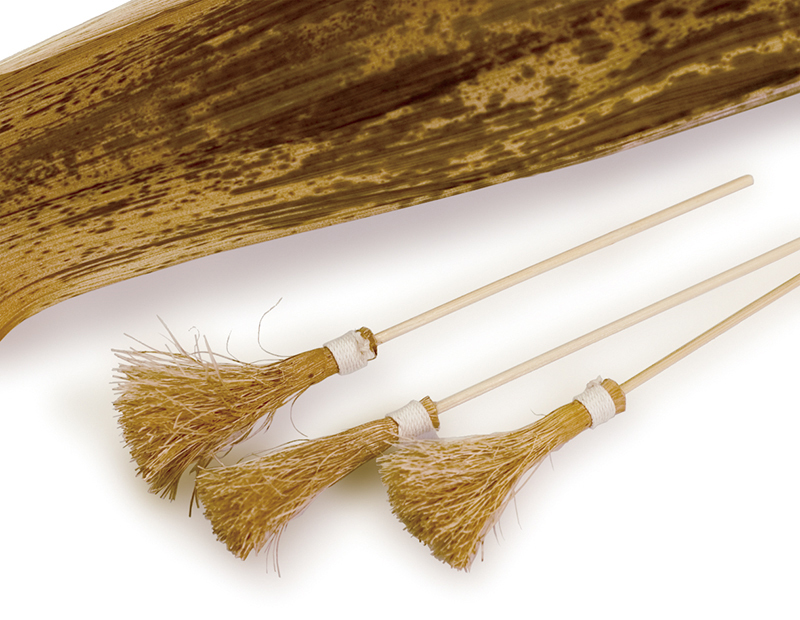 The advantage of the hakobi is that it can carry much more paint in its split bamboo skin fibers than a brush. After using the hakobi, rinse off the paint and glue and dry well. You can use a thick brush cut short in place of a hakobi. To make your own hakobi, you need bamboo skin, a stick such as a chopstick or bamboo skewer, and thread. Use bamboo skin that comes from as close to the hard section of the bamboo base as possible. For example, you can use bamboo skin left over from wrapping a baren. For a hakobi, you will need three sections of bamboo skin about 5 cm in width and 10 cm in length. First, soak the bamboo skin in warm water for about seven minutes. After the bamboo skin has soaked in warm water, cut a notch perpendicular to the fiber on the inner surface about 2 cm up from the root. Bend the skin at the notch and strip away the cuticle. With the cuticle stripped off, wrap the skin around the stick with the fibers running parallel to the stick and tie it firmly in place with thread. Cut off the end of the bamboo skin about 3 to 4 cm from the stick and use a pushpin or needle to split the skin along the fibers and form a broom shape. The finer the tips of the bamboo skin are, the more paint the hakobi can gather. You can make this fiber-splitting task go much more quickly by using a comb-like tool called a sakikushi, which holds five or six large sewing needles in between two pieces of wood. If you use the thin piece of bamboo skin to make a hakobi, the cuticle can be difficult to remove. In such cases, first bind the skin to the stick with thread without stripping the cuticle and then soak it in warm water. Then, beat the tip of the bamboo skin with a wooden mallet. You can then strip the loosened cuticle from the fibers of the bamboo skin. Hakobi are also available for purchase at art supply stores that carry block print tools.